I am so happy to see you today and Welcome to Full Plate Thursday! I have been standing at the gate just waiting for you to arrive, I always get so excited when it's Thursday so I can see what you brought in your basket to share with us . I sure hope that you enjoy yourself today and see old friends and make new ones. Thank you so much for coming today and I hope you have a very special week end! Thank you for hosting this event...I had such a good time looking at your previous posts...I am sure that I will be a regular visitor. That orange creamsicle!! I'm craving. I hope you like my instructions for brining a chicken and the article I shared. As always..it looks as if you are having a great group of recipes to choose from! Thank you so much for hosting! I'm sharing two Easter recipes this week. Thanks for hosting Miz Helen. Have a great day! Yes, the Orange Dreamsicle Float definitely caught my eye. Stopping by for the first time on full plate Thursday, love your story about it and what wonderful memories. I've brought some Butterscotch Bars (GF) to add to the table today. What an array of beautiful dishes you have here! Hi Miz Helen! I am sharing my recipe for Prune And Sour Cream Muffins. This recipe is gluten free, but it can be made with "regular" flour if you don't have issues with gluten. Miz Helen, I'm bringing another sweet treat for the little ones! Hi Ms. Helen! I'm bringing my handy-dandy, easy-breezy Chicken and Rice! It is so wonderful for company because it is so easy and tastes so good! Thank you so much for hosting this week's yummy plate of home - there are so many incredible recipes! I am so excited to try them! Oh, my gosh thanks for the Red Plate, that is so kind of you !!!!! Thanks for hosting !!!! Thanks for the the feature Miz Helen! Looking forward to going through all the recipes this week! I added my Tomato Soup this week. I sure hope you have a great Easter! Thanks for hosting! Thanks for hosting. This week I added our family's traditional Easter Meat Pie or Pizza Rustica. I always enjoy visiting everyone to see their delicious recipes. I shared a different twist on Chicken Pot Pie with my Chicken Pot Pie Soup w/ Dumplings. I'm also hosting my very first blog hop over at Peas & Carrots if anyone is interested in linking up. It's at www.navefamilyfood.blogspot.com. Today I shared a strawberry glazed steamed Indian cheese cake which is just perfect as fusion dessert. My eyes are already feasting on such lovely entries !! Hunt all those Eater Eggs and a Happy Easter Weekend. Good evening Miz Helen, sharing a cake I make in honor of my own grandma. I cannot wait for the rhubarb! Thanks for hosting. 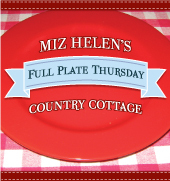 Hi Miz Helen, I've brought a loaf of bread to share with Full Plate Thursday! Happy Easter and have a lovely Easter weekend! Miz Helen~ Thank you so much for the feature! Have a great weekend! Greetings to you Miz Helen. I'm so excited to be featured this week. You offer us so many yummy treats!! I've been so behind and just got here late for the party. Thanks for including my Coco-Cabana Bars. Now on to explore all the great links! Have a great day Miz Helen. Thank you so much for featuring my Spinach and Orzo pie! Made my day! I just want to grab a fork and dig in.